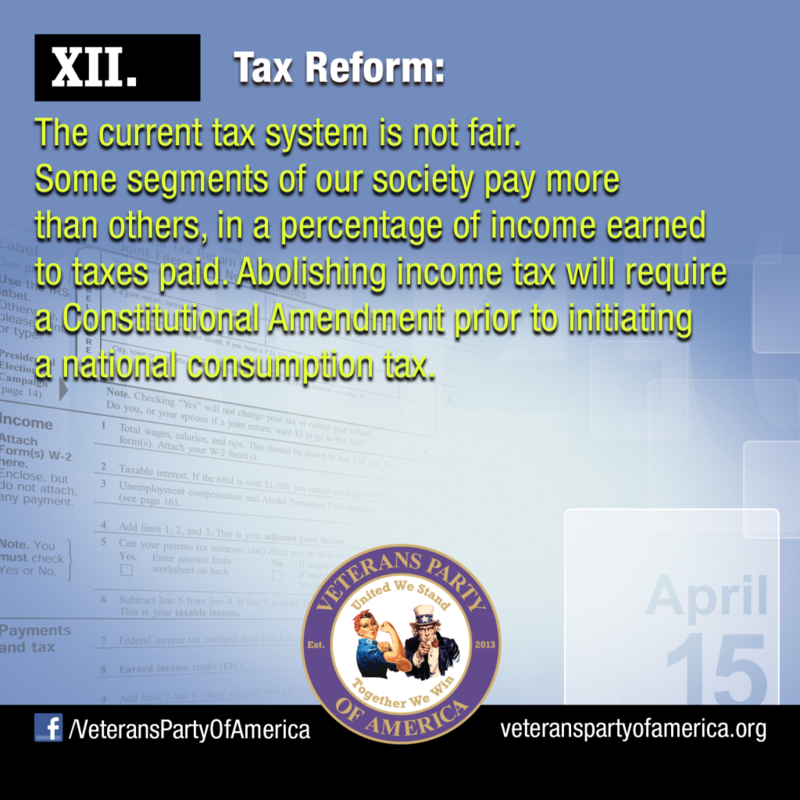 The Veterans Party of America has been formed to provide a viable choice for the American people. 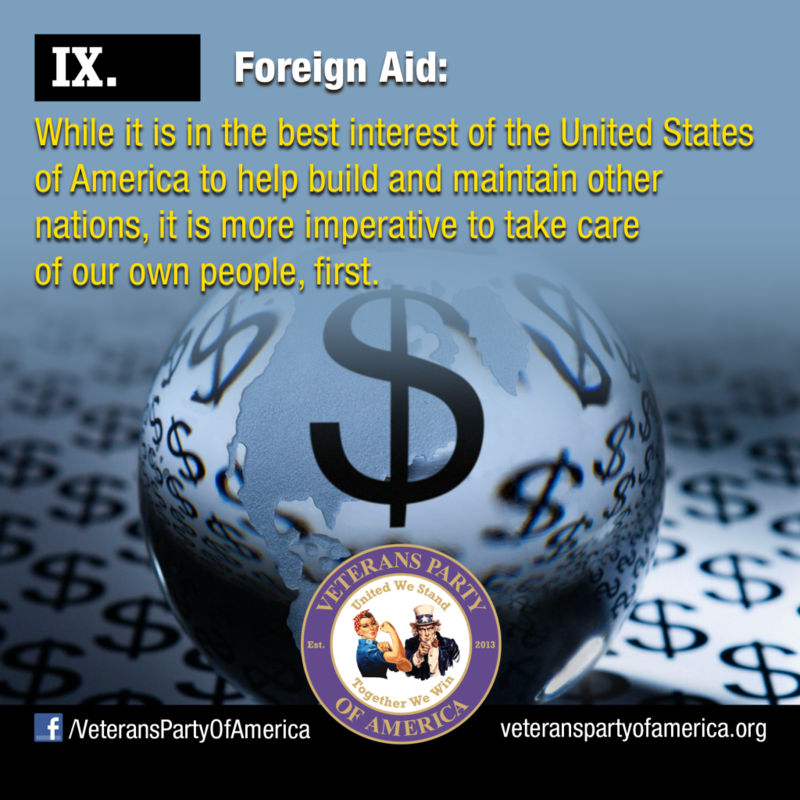 Veterans Party of America's goal is to place solution oriented leadership into public offices around the nation in all forms of government. The Veterans Party of America is neither politically left or right. 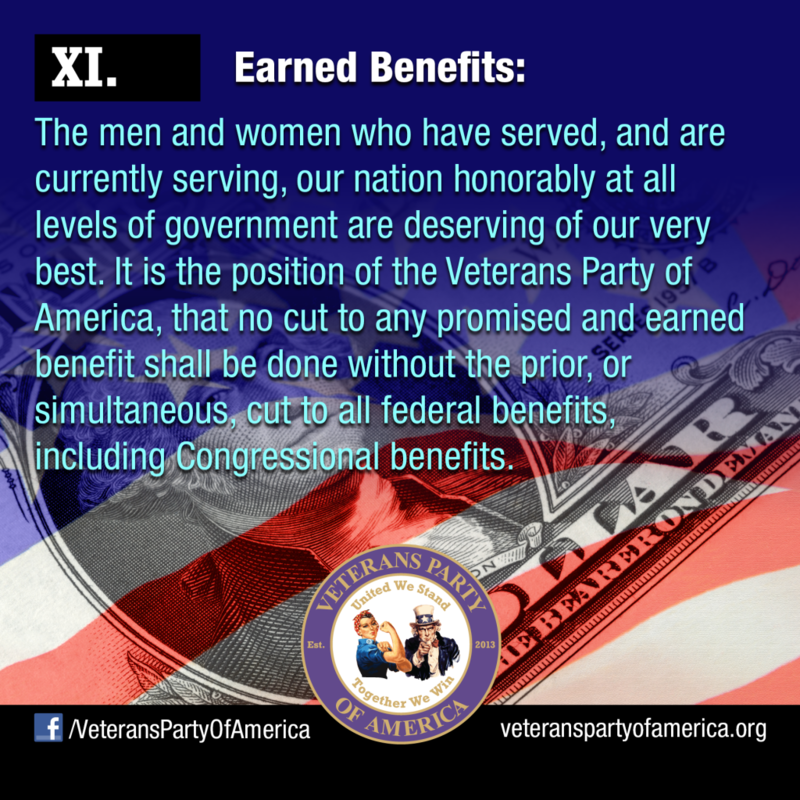 The Veterans Party of America is a centrist party, which is inclusive to all American citizens. Veterans Party of America feels that the two party political system has derided the intent of our founding fathers concept of a Constitutional Republic, where the citizens can freely vote for the best candidate, versus voting for the party. “Promote the general welfare and secure the blessings of liberty to ourselves and our posterity,” is in the first paragraph of our Constitution. That Statement serves to remind us and our leadership why this great nation was formed. We have a responsibility to ensure all our Constitutional liberties are maintained and protected for future generations. As leaders, our elected officials must own the problems of the office they gain from the moment they are elected. 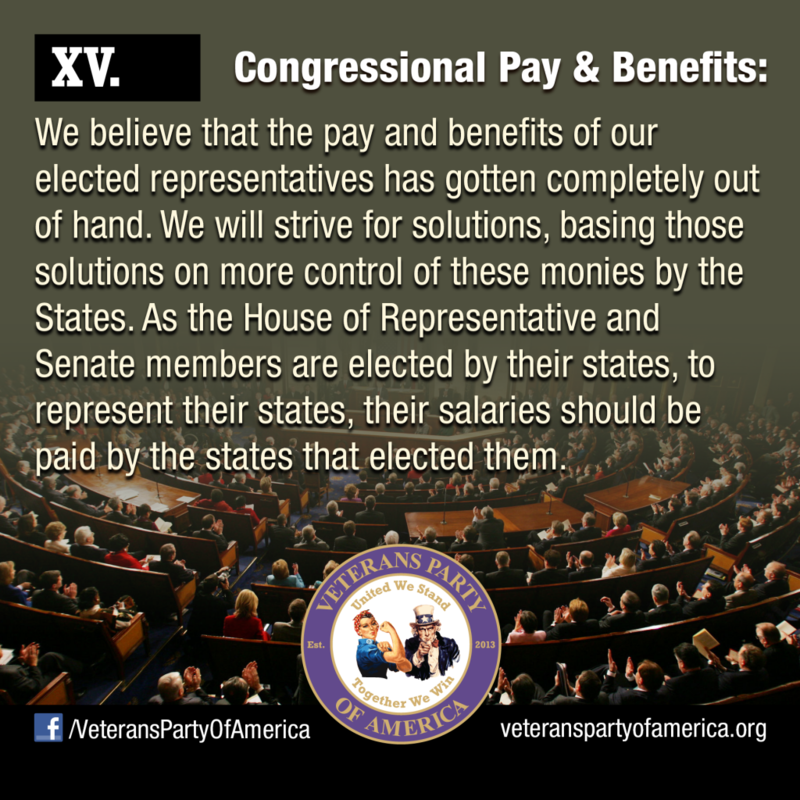 Veterans Party of America expect and demand solutions, not excuses, from our leadership. Elected Officials are to be held accountable for the problems they willingly inherit, or create, until the issue is resolved in accordance with, and under, the parameters set forth in the Constitution. 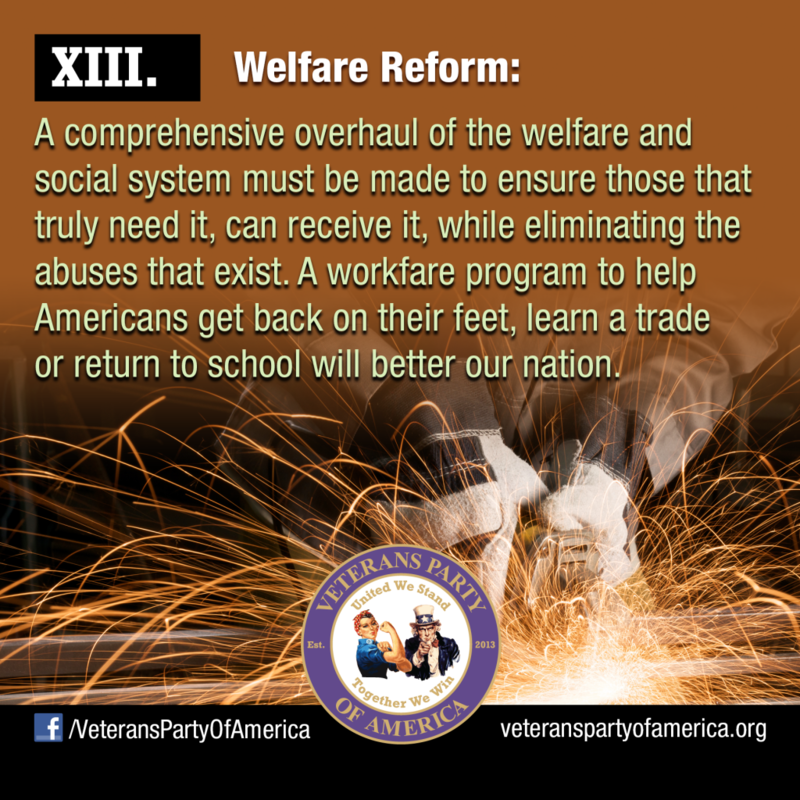 The Veterans Party of America maintains a national focus. The Veterans Party of America remains a national party concerned with matters of Constitutional significance to which all States must adhere, yet giving all enumerating Constitutional Federal restrictions back to States as provided by in the US Constitution. 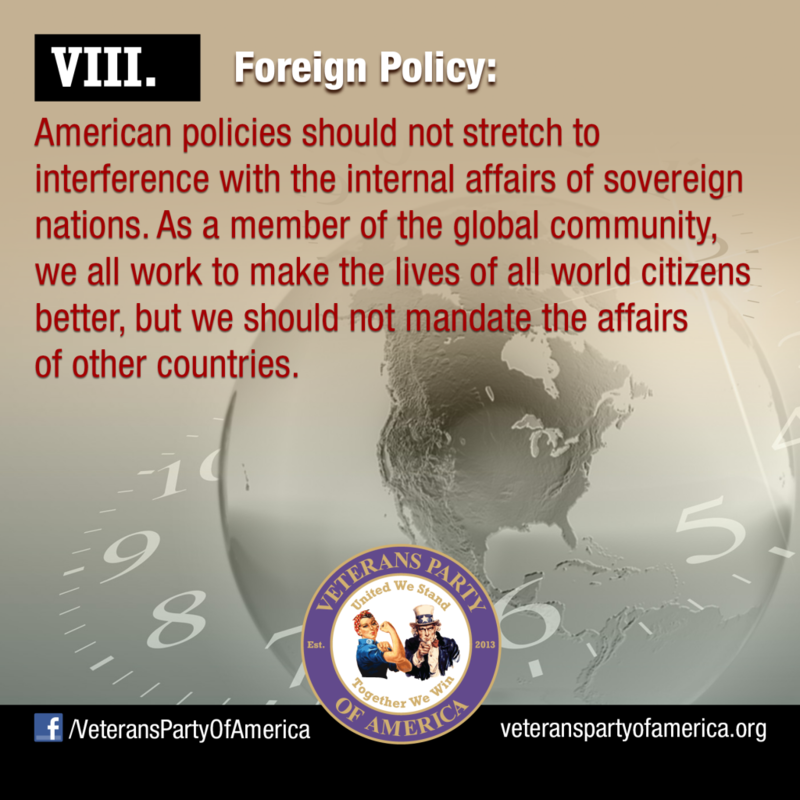 Veterans Party of America presents no firm stance on the various State-specific issues. 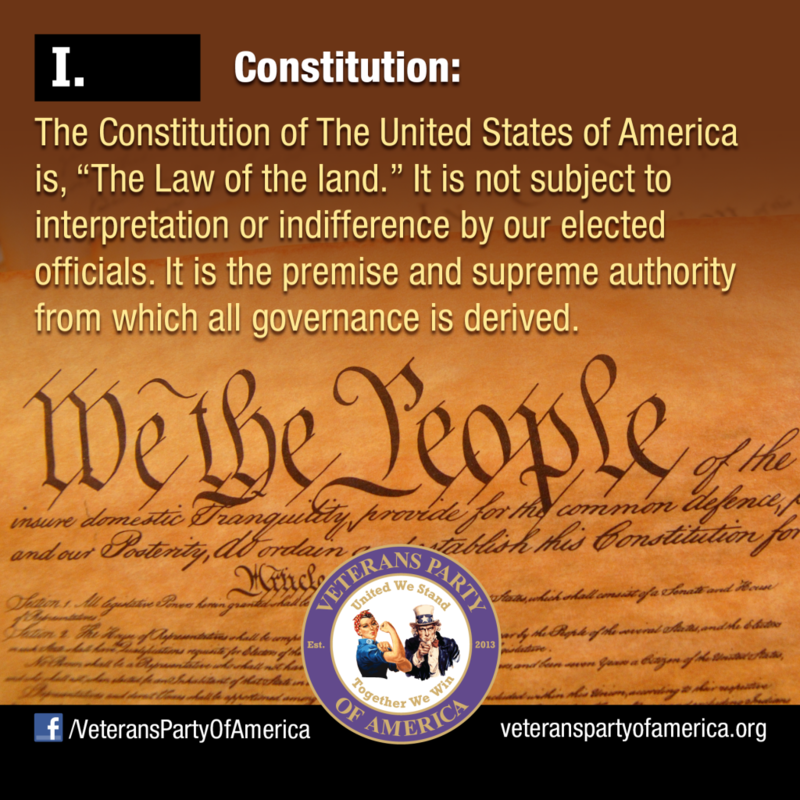 The Veterans Party of America fully supports and abides by the 10th Amendment to the U.S. Constitution, which states: 'The powers not delegated to the United States by the Constitution, nor prohibited by it to the States, are reserved to the States respectively, or to the people. This platform is a living document and will be reviewed in accordance with the Party's Constitution and By Laws in order to meet the ever changing political landscape of today's world. The Constitution of the United States of America is the “Law of the Land.” It is not subject to interpretation or indifference by our elected officials for their own purposes. It provides the basis and supreme authority from which all governance is derived. It is only to be changed by the will of the people via duly ratified constitutional amendments, not by Executive Order, judicial decree, or a particular party in power. Under no circumstance shall the Veterans Party of America support laws that infringe on the provisions of the Constitution of the United States of America, including the Bill of Rights and all other amendments. 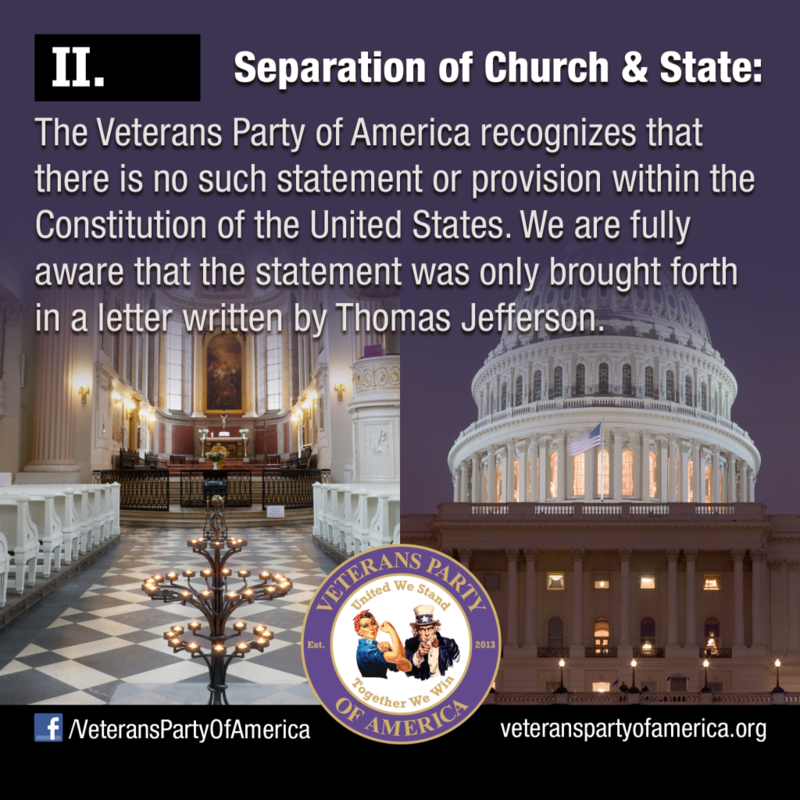 The Veterans Party of America adheres to the proposition that there shall be no State established church. We stand with the Constitution and support freedom of religion. No single, or group, of peaceful religion(s) shall be placed above another. To ensure this, we, as Americans, must strive to keep religious mandates out of government. We fully recognize and appreciate that one’s religion guides their sound decision making processes and the basis of their good and noble character. We also believe that those without religious affiliation can be, and are, just as sound and noble of character and are fully capable of making sound decisions in the best interest of our fellow citizens. As such, we will judge our leadership and the content of their character by their words and actions; not by their religious affiliation. America is in a major economic crisis. 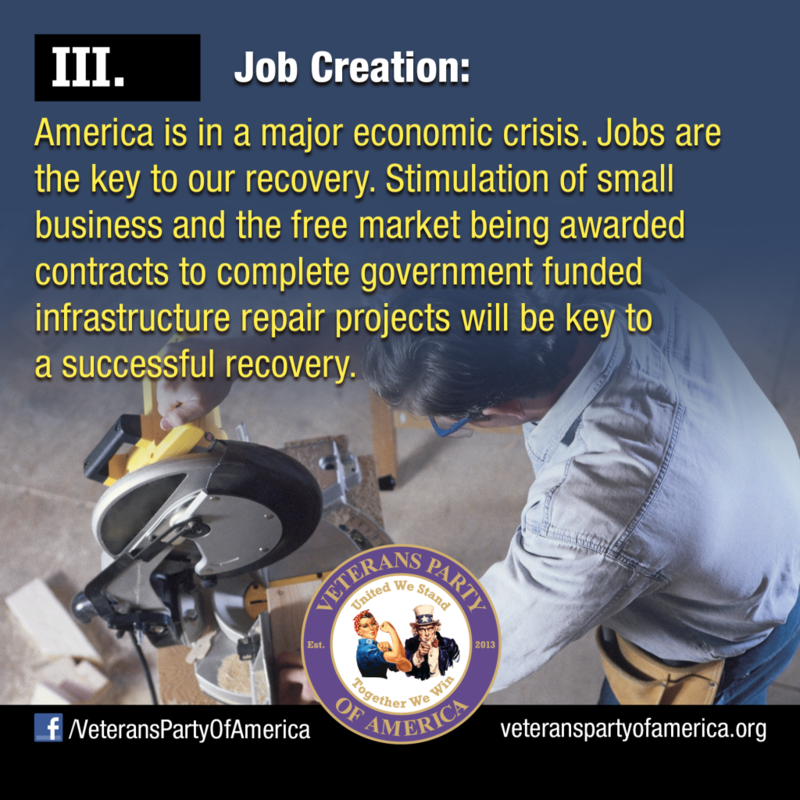 Jobs are the key to our recovery. To address the problem of crumbling infrastructure across the nation, we will encourage private sector businesses to bid on federally funded repair projects. In order to maintain and attract business in the U.S., we must be more competitive in the global economy. We support comprehensive reevaluation of and appropriate modifications to existing regulations and corporate taxes in order to promote job growth. As well, we will scrutinize International Trade deals and make necessary changes to those which have been hurting job growth in this country far too long. Before Immigration and National Security can be brought into perspective, our borders must be properly secured, with adequate crossing points and transit lanes for legal entrance into America. 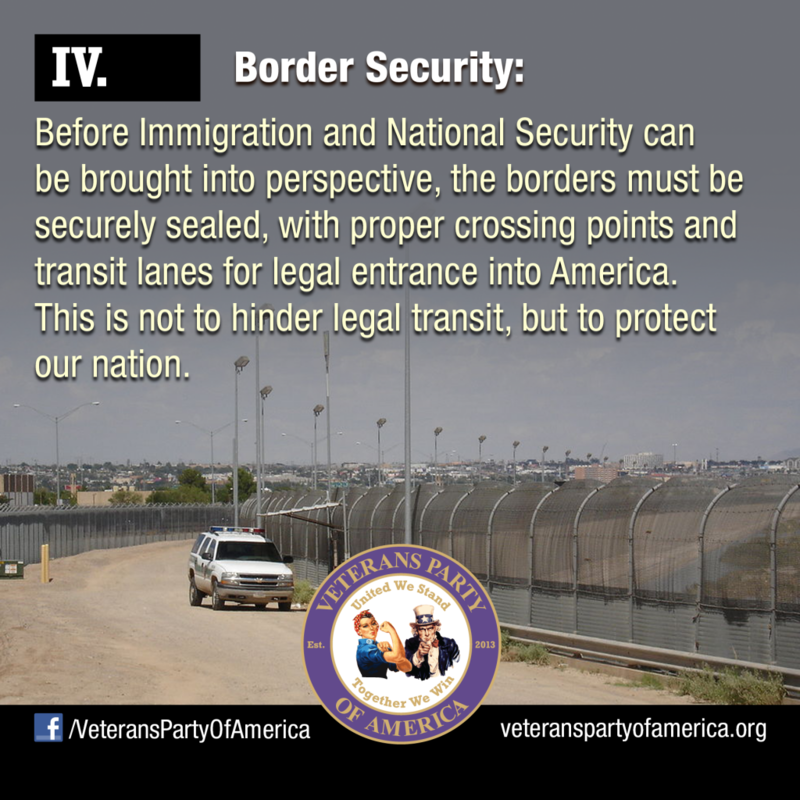 This is not to hinder legal transit, but to protect our nation. While the federal government is responsible for international borders, airports, and seaports; individual states shall be allowed to also guarantee the security of their borders with foreign countries, international airports, and seaports that have transit with international waters. In order to provide the greatest combination of standards for conduct, training, accountability, and oversight, we propose that these assignments be allotted to government-appointed bodies, and not contracted out to private-sector agencies. The security and safety of our country and people is the highest priority. This is the responsibility of the Federal government. The strength of our nation is our military. Having a strong, well trained, all volunteer force is essential. The military forces of the United States of America belong to the United States of America and are not to be used for foreign entanglements that do not directly threaten our nation’s security. The President of the United States is Commander in Chief of the armed forces and has constitutional authority to mobilize troops (Article 2, Section 2, Clause 1). But long-term deployments and financial support of troops engaging in war must be authorized by a formal declaration of war from Congress (Article 1, Section 8, Clause 11). At no time will the needs of National Security violate the inalienable rights guaranteed in the Constitution. 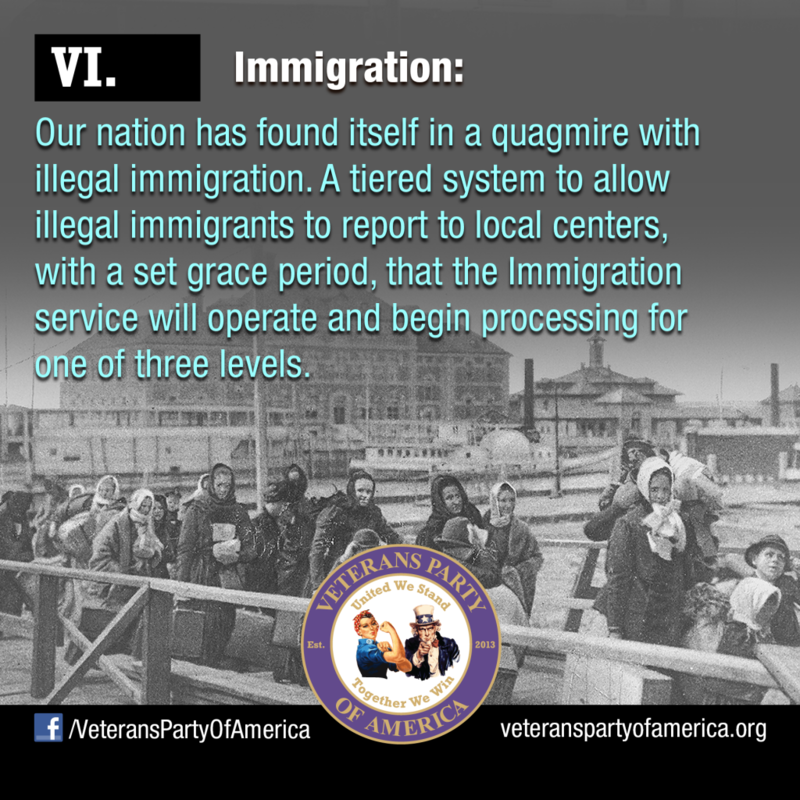 The Veterans Party of America's position on immigration is the safety and security of our nation and its citizens. It is the responsibility of the Federal government and should be its highest priority. Any executive actions that undermine the immigration policies and laws of this nation must be addressed by congress without prejudice. 1. We must secure all borders and international ports of entry to properly protect our nation from potential threats foreign and domestic. 2. We must enforce immigration laws, by supporting legislation that will provide for Border State agencies to coordinate the implementation and enforcement of national immigration laws, including directing resources to the Border States to fund the National Guard or Militia to work with National Border Security Agencies. 3. All illegal and undocumented immigrants must report to a local immigration center and get registered with a firm deadline for compliance. a. Any illegal or undocumented immigrants that fail to register are subject to immediate and permanent deportation. b. All registered immigrants with any felony or State level misdemeanor conviction, even if later cleared or expunged by any method, shall immediately face permanent deportation. c. All illegal or undocumented immigrants found trying to illegally enter the United States after the registration deadline is subject to immediate and permanent deportation. d. Any illegal immigrant under the age of 18 may be represented by an attorney prior to facing deportation, paid for by country of origin, including withholding funds from foreign aid. 4. The Veterans Party of America supports the hiring of ICE Agents at an accelerated rate to meet the National and Border State demands of at least 60,000 Border Patrol agents. This increase in Border security shall be paid for by exact budget stipulations in the Home Land Security funding. 5. All illegal or undocumented immigrants will be treated humanely, respectfully, with critical medical care as required and then returned to country of origin. The country of origin shall be responsible for all expenses, medical or otherwise. These funds shall be deducted from any foreign aid those countries of origin may receive. 6. Any immigrants properly documented by the end of the registration deadline, but are not prepared for filing for permanent residency status must acquire a sponsor, learn a sufficient level of the English language for public safety, becoming proficient in the common language, and shall be given a grace period to complete the application process, based on each individual applicant’s needs, not to exceed 5 years, without extensions. 7. All documented immigrants between the ages of 6 & 18, depending on State law, must be registered in and regularly attend school. 8. No illegal immigrants under this provision will be eligible for permanent status ahead of legal immigrants already engaged in the application process. 9. All documented immigrants over 18, residing in the United States, seeking permanent status must be employed with a tax identification number, or be a full time student. 10. Any corporations, conducting business in the United States found to hire illegal immigrants, upon conviction shall be fined 1 million dollars or 51% of their business holding, whichever is less. We need to make it easier for businesses to block sponsor immigrant workers (VISA) from countries of origin, through US Embassies and Consulates, provided the corporation can document an insufficient labor source already existing in the particular area. 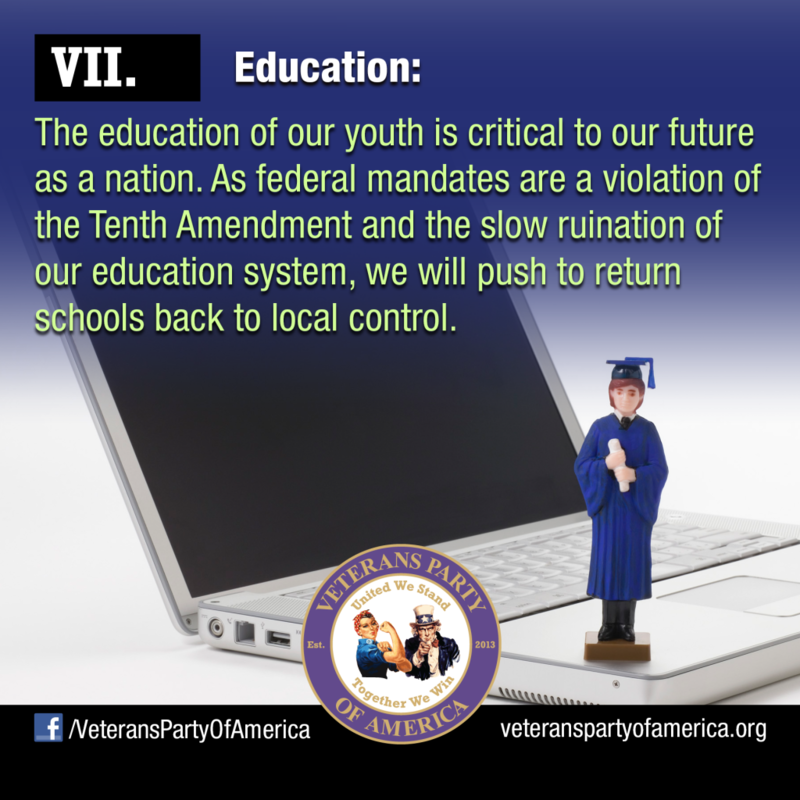 The Veterans Party of America understands the education of our youth is critical to our future as a nation. Federal mandates are a violation of the Tenth Amendment. The elected officials in the local communities are closest to the people. Federal mandates involving high stakes testing, teacher evaluations, including National Common Core State Standards will be done away with. Any decisions made with regards to education reform will not be made without input from teachers from across the nation, at the local levels. No one knows what needs to be done better than those in the classroom every day. No Federal monies will be given to “for profit” charter schools or private schools, except in the form of tuition vouchers, allowing parents to have a choice. Furthermore, the Veterans Party of America favors abolishing the federal Department of Education and returning all education matters to the States. American policies should not stretch to interference with the internal affairs of sovereign nations. As a member of the global community, we all work to make the lives of all world citizens better, but we should not mandate the affairs of other countries. While it is in the best interest of the United States of America to help build and maintain foreign nations-in-need, it is imperative that we tend to our own shortcomings, first and foremost. In addition to putting our citizenry first, we must recognize that it would be a disservice to allow any nation to become dependent on the welfare of a foreign power. Whenever possible, in times of hardship, we should elect to send personnel and equipment, rather than money, with the goal of providing training and instruction to countries in need to promote a self-sustaining infrastructure. When reviewing foreign aid contributions, we must consider the benefit that such an endowment might have to our own interests, while also weighing the foreign nation’s degree of need. Peace and stability is important, as is the health and welfare of our own people. The spending by government at all levels is out of control. 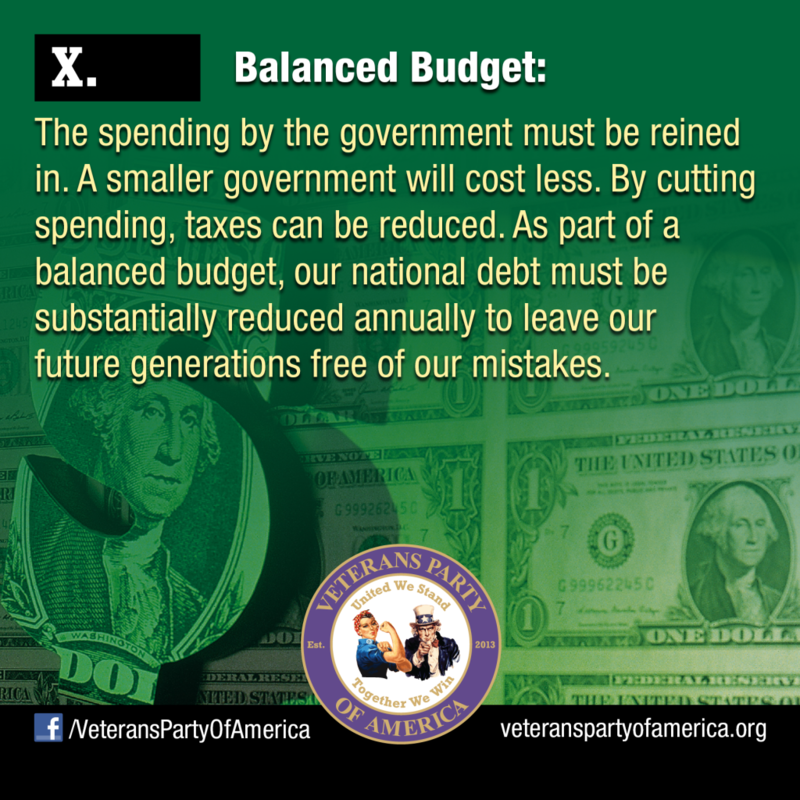 The Veterans Party of America believes it is in the best interest of our Nation to reduce the national debt by reducing the size of government through major spending cuts that will automatically eliminate unconstitutional departments. This will require a Constitutional Amendment to ensure America will remain on a balanced budget. We view benefits as something earned. Examples of earned benefits include, but are not limited to, Social Security, Federal Employee Retirement Pay, Military Pay and Benefits, Military Retirement Pay, Tri Care, Veterans’ Medical Care, and Medicare. States have the right to place their state level benefits in their platform. We view unearned benefits as something given for simply existing and being a citizen within the borders of our great nation. These include, but are not limited to, welfare, housing assistance, Income Credit, and Medicaid. Earned benefits are not handouts, they are "Earned" and should not be infringed upon. They should be included as part of the federal budget not used or decreased as a means to balance the budget. The current tax system is not fair. Some segments of our society pay more than others, in a percentage of income earned to taxes paid. Here is how it currently works: Let’s say we have two taxpayers A and B. A has a taxable income of 10,000 and B has a taxable income of 20,000. For this example we will set their tax rate at 10 and 15 percent respectively. Taxpayer A owes 1,000 in income tax and B owes 2,500 in income tax. Logically one would think that taxpayer B would owe more than 2,500 because 15 percent of 20,000 is 3,000. Now for the actual math. Taxpayer A's taxes are calculated at a straight forward 10 percent of his/her taxable income. Taxpayer B has a couple of steps to calculate his/her taxes, this is because of the concept of income tax brackets. For this purpose the bracket upper limit between the two is set at 10,000 and below for the 10 percent bracket and 10,001 and above for the 15 percent bracket. Taxpayer B pays 10 percent of the first part of his/her taxable income and 15 percent for the remainder. So for the first 10,000 a 10 percent rate is levied and for the next 10,000 a 15 percent rate is levied. Therefore 10 percent of the first 10,000 is 1,000 and 15 percent of the next 10,000 is 1,500 and add the two together you get 2,500. This pattern would be repeated for additional tax brackets paying the levied rate only for the amounts over the upper limit of the lower bracket and adding the amounts assessed in the lower brackets. As you can see, higher earners actually pay less in taxes on their total income. There are also tax exemptions for some sources of income (such as entertainment and sports industries). A national consumption (sales) tax will make it fair based on the spending of people versus their income. Essential life items, such as foods purchased from a store, or any other location that is not a food serving industry (i.e. restaurants), should be exempt. Abolishing income tax will require a Constitutional Amendment prior to initiating a national consumption tax. A comprehensive overhaul of the welfare and social system must be made to ensure those that truly need it, can receive it, while eliminating the abuses that exist. A workfare program to help Americans get back on their feet, learn a trade or return to school will better serve our nation and it's citizens. This will reduce costs and get people back to work, helping those that need help. The encouragement of charities will also aid in making our nation strong again. State election laws should be equitable, and ensure voter fraud does not occur. We support States passing measures to provide armed guards for ballots, voter ID requirements, and the ability to delay official voting results until determination is made that military absentee ballots have been accounted for or will not affect the outcome of an election. Further, we support State laws covering public official convicted of committing voter fraud shall be considered felonies. In States that do not require identification to vote, an affidavit should be signed in the presence of the polling place supervisor and filed. Filing a false affidavit would be treated as a felonious violation of federal election laws. The Electoral College must be reformed. We support each State awarding their electoral vote proportional (by Congressional District, rather than all electoral votes in a State going to one candidate). Congressional Districts must be drawn using natural or clearly defined boundaries, not based on any other factor. 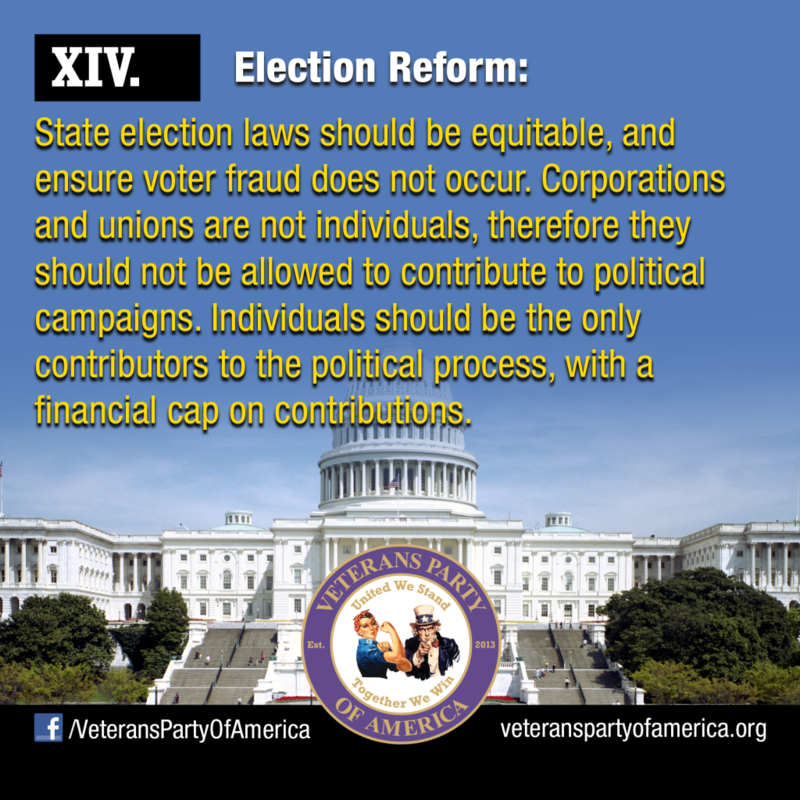 The Veterans Party of America believes that the constitutional access to the ballot box has been hijacked. We also support the amendment of all State election codes to return the ballot to the people by enforcement of the constitutional right to associate or not to associate with any political party. Corporations and unions are not individuals; therefore they should not be allowed to contribute to political campaigns. Individuals should be the only contributors to the political process. Contributions will be limited to donating only to candidates for which the individual is able to vote. This will require a Constitutional Amendment. We believe that the pay, benefits and the way our elected representatives conduct legislative business has gotten completely out of hand. We will strive for solutions, basing those solutions on more control of these monies by the States. As the House of Representative and Senate members are elected by their States, to represent their States, their salaries should be paid by the States that elected them. Salaries should also be set by the State. Federal retirement will not apply to members of Congress. Any benefits will come from the elector’s State and must meet the same criteria as all State employees. This will require a Constitutional Amendment. Federal legislation has deteriorated into what is essentially a “shell game” with bills being written with one title, while the bulk of the expense for it is in reality one or more “pet projects” that benefit a particular Congress person’s district or a business located there. These additional projects are referred to as “riders” or “pork” and should be eliminated, if a bill cannot stand on the merits of the title project, then it should not be federally funded. Each bill passed through Congress shall have no unrelated projects added, this is part of the reason the national debt is so high, and it only benefits those in power. Each bill will require the Constitutional authority to be annotated in the bill, before being introduced. 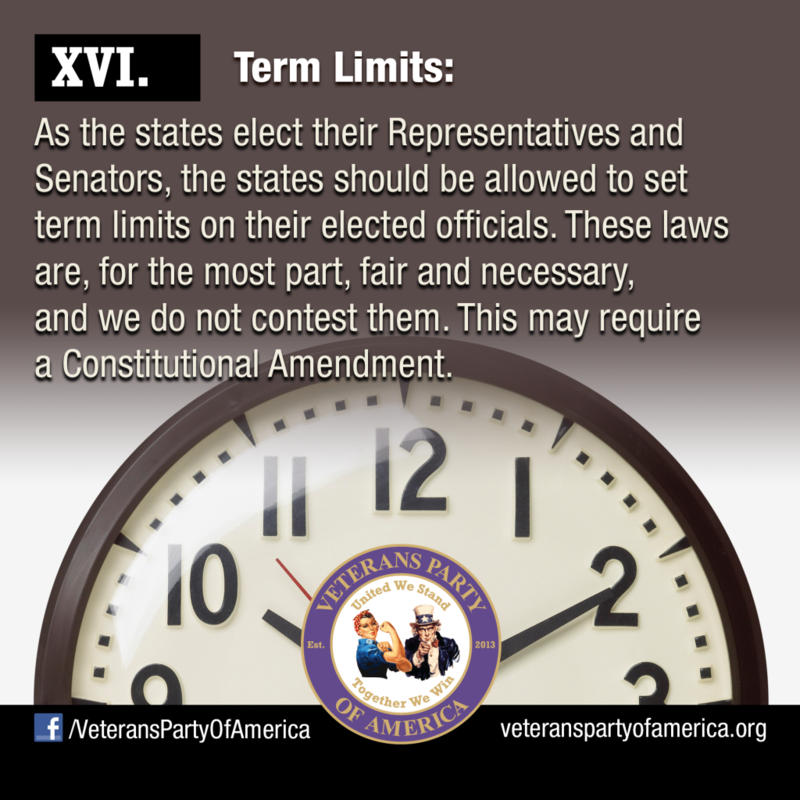 As states elect their Representatives and Senators, the states will be allowed to set term limits on their elected seats. These laws are meant to be fair and impartial, and we do not contest them. This may require a Constitutional Amendment. 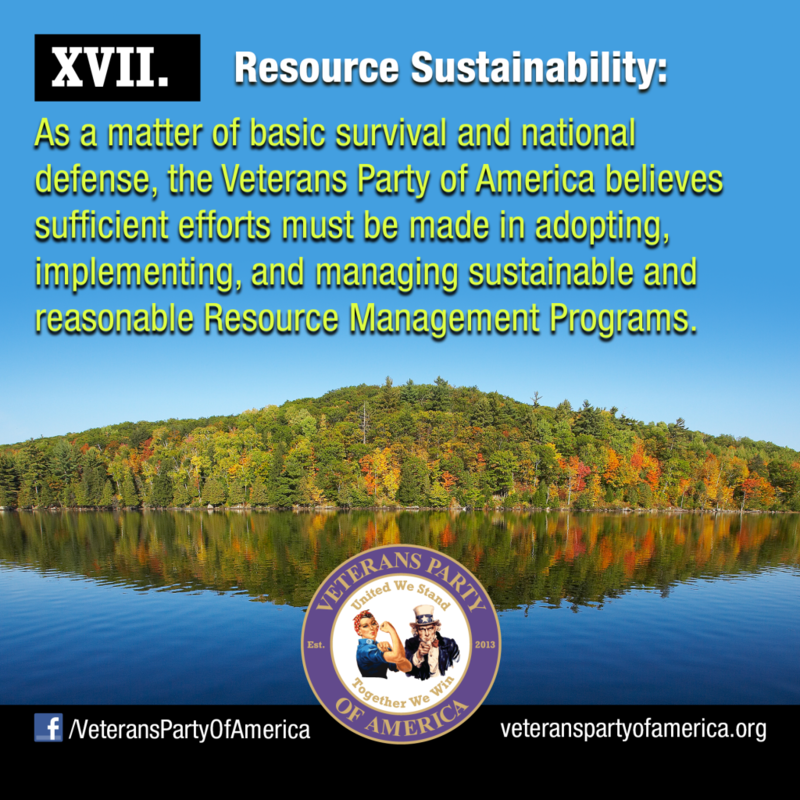 As a matter of basic survival and national defense, the Veterans Party of America believes sufficient efforts must be made in adopting, implementing, and managing sustainable and reasonable Resource Management Programs. These Resource Management Programs include, but are not limited to: water, soil, timber, fauna, agriculture, fossil fuels, renewable energy sources, and waste management. Resource Management is a state jurisdiction issue. However, the Federal Government must be involved in establishing reasonable minimum guidelines, as well as for assisting with coordinating Resource Management efforts for multi-state resources. 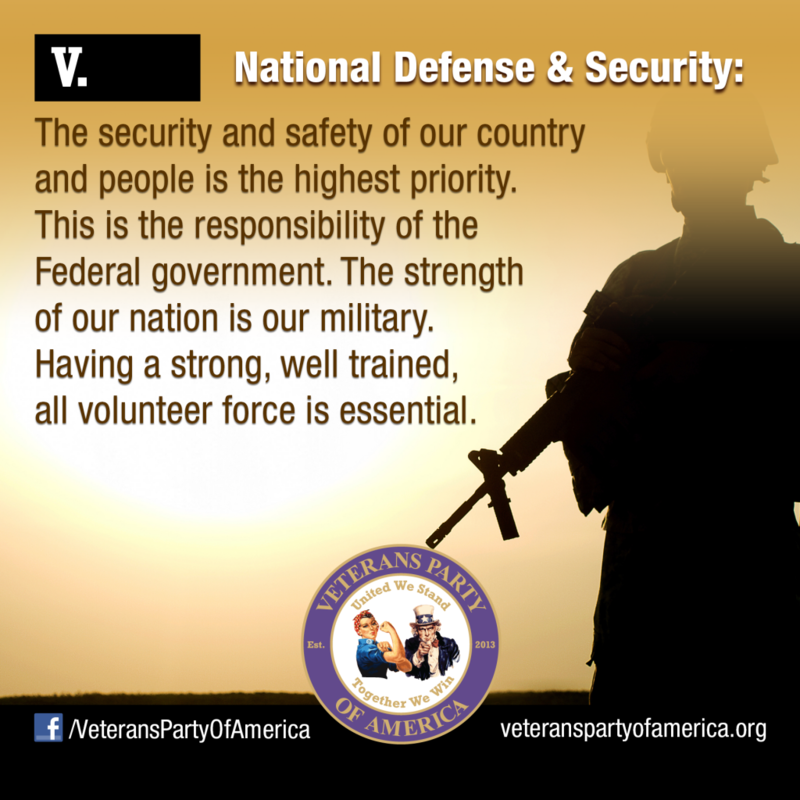 The Veterans Party of America believes reducing our carbon footprint is a noble effort. It is a fact that global temperatures have risen over the last century with the last ten to fifteen years remaining level, and as such, we will not buckle to reactionary legislation introduced by those supporting the alarmist view of, “Global Warming and Climate Change,” nor will we passively sit on the sideline as resources are consumed and damaged with reckless abandon by aggressive industries seeking profits. It is also a fact that mankind has survived two previous eras with much higher temperatures. Our stance is to be prudent when seeking answers to reducing our carbon footprint and conserving what we have today for future generations. We will support reasonable legislation to do so without overburdening our industrial production and growth. We want clean air, water, and healthy habitats for our wildlife along with jobs and economic development. It is our belief that we can achieve all by working together in a prudent and reasonable manner. 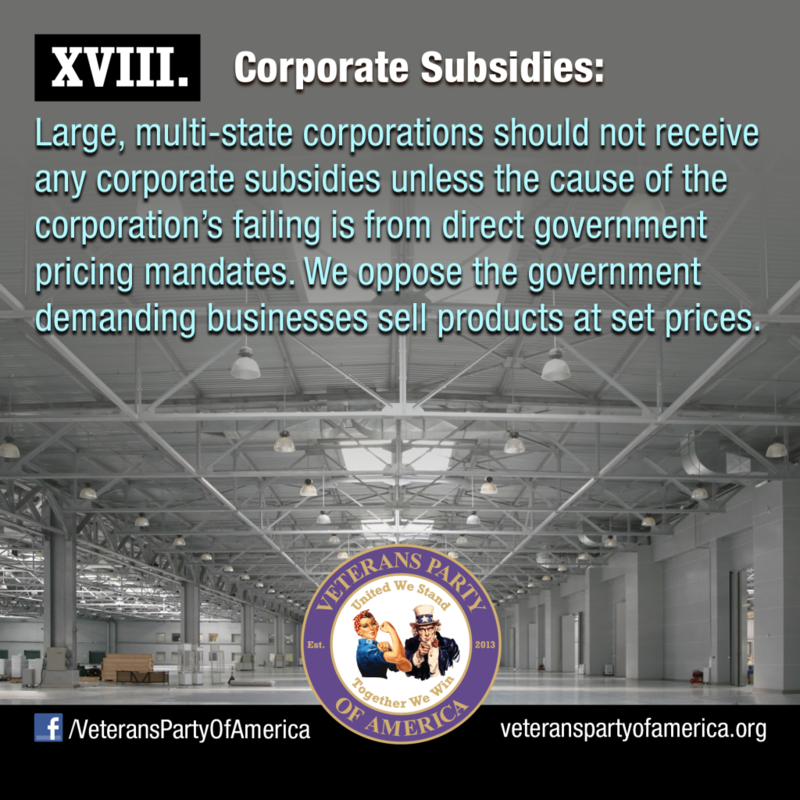 Large, multi-state corporations should not receive any corporate subsidies unless the cause of the corporation’s failing is from direct government pricing mandates. We believe that the government has no power over pricing except in the protection of the people from price gouging and other illegal and unethical business practices. 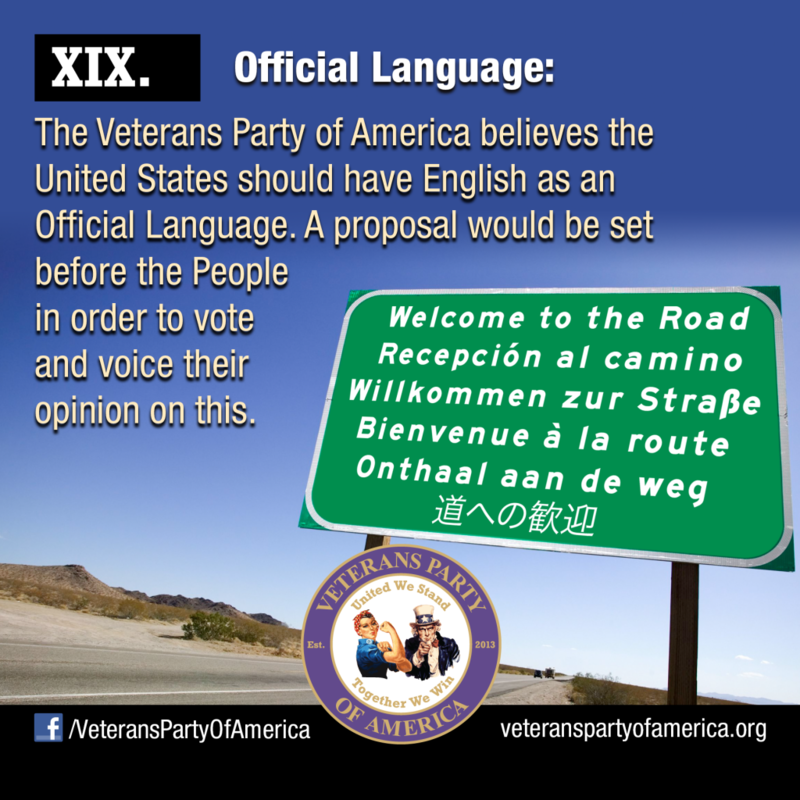 The Veterans Party of America believes the United States should have English as an Official Language. A proposal would be set before the People in order to vote and voice their opinion on this. States and Territories have the right, on the State and Territorial level only, to enact a secondary language that is rich in their culture and history. Said right for a secondary language would not be in any effect at the federal level, with English as the Primary and Sole Official National Language.